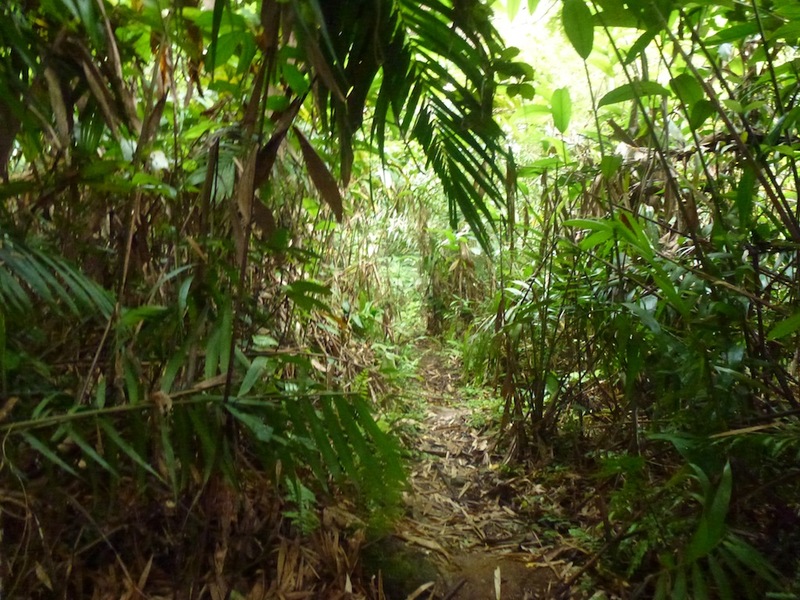 A lovely path through the rainforest that can easily take you to unknown places. Recently I was reminded of a little adventure I had awhile back, (read: when things don’t go exactly the way you plan them!). We had completed our flying for the day and I had stayed behind at the plane to finish tying things down and to do the paperwork. When that was done I slung my backpack over my shoulder and headed into the forest toward the river and our camp. I had a plan to mosey back, looking for animals and birds along the way, on the winding rainforest paths I had walked on the days before. Rosie Ruf, our hostess at the Okapi Reserve, had warned us about getting lost, but I am an old hand at the African bush and fancy it pretty hard to get “lost”. I take the opinion, like Daniel Boone, that you may not know exactly where you are, but if you know the kind of country and how to live in it that is usually good enough if you don’t have something else you are meant to be doing. So I enjoyed the incredibly dense forest, seeing about 4 different types of monkeys and many beautiful birds up in the canopy and, as I walked on this very overcast day on very winding paths, I kept what I thought to be a general direction toward the camp. I began coming to paths I wanted to take but after I went down them for a while, and they were so flooded that I would have had to take off my shoes and role up my pants to get through, I just went back and took the next path. This happened a few times and after about an hour I came out into an open area that, if I was where I thought I was, would put me about 3 kilometers from my destination. IF! So I carried on in this roundabout way. Twice I came upon Pygmies who seemed truly happy to see me, as if I were a long lost friend. I asked them if this was the way to Epulu and they said “Yes”. Africans are very happy to please you and would never want to discourage or disagree with you, so “yes” is usually the answer to your question if they think that is what you want to hear. After about another hour I realized I had no idea where I was. If you don’t know where you are, it is incredibly difficult to get to where you want to go! With no direction from the sun, which is very important when orienteering, and no horizon to give a landmark and all the trees looking very much the same, I finally said to myself, “I know one thing. I know where I came from.” So, I turned around 180 degrees and followed my tracks back to the airplane and from there home by the ordinary way. There was never an emergency. A 4 hour walk. I was not in imminent danger. But it did give me pause to think that I don’t know everything. I can get lost. I really do need the help of certain things to keep my bearings and end up where I want to be. It is the same in my spiritual life. It is easy to get casual or cool to the prompting of the Lord and to think that you have been doing this a very long time and are beyond the attractions that would take you ever so slowly down paths you know won’t work. There are distractions. Busyness. You take an easy way that doesn’t require special effort thinking you can always make a few adjustments to your course later when it is more convenient. You might even get some bad advice from people who mean well but don’t know the answers you need, or even worse, are willing to lead you the wrong way. Most of all, you may think that you can take your eyes off the Son. That you now have that built in compass that allows you to wander at will and when you are ready, you can turn on course and just go home. We don’t even realize the many elements that make up that ability to do the homing pigeon thing. But as those elements get taken away, little by little, we find that we are lost without even a slight clue of which way to turn to get home. Fortunately, we know that our Shepherd and guide is not trying to keep it all hidden from us. He calls to us, “Come”. I AM the way. The meaning of repentance is to turn around. The 180 degree turn that takes us home. 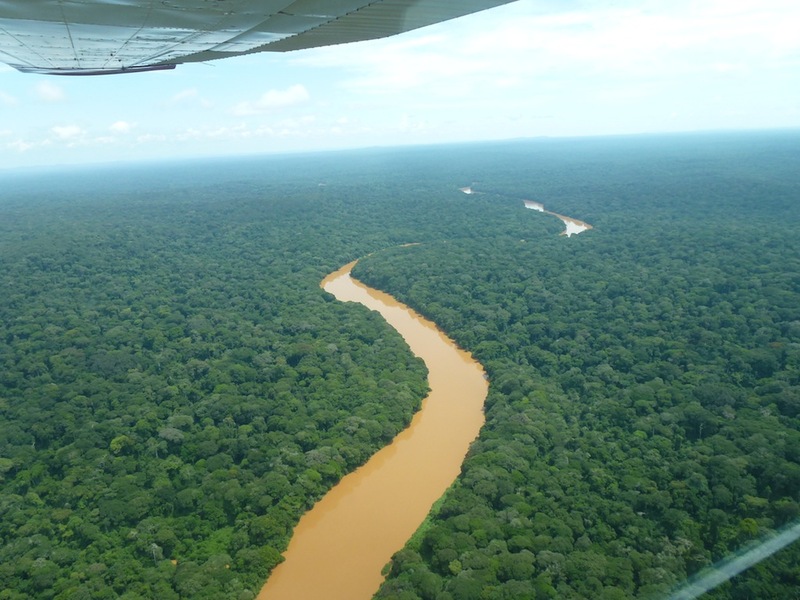 The trees of the Ituri Rainforest run on and on for what seems to be forever. A great place to loose yourself if you are not careful. 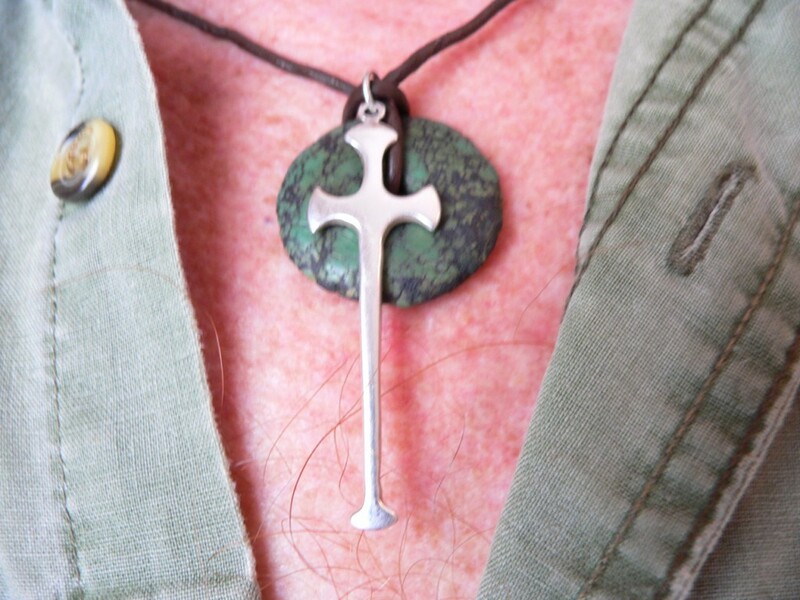 This Cross was made for me by my lovely wife Cher for Christmas when we were making gifts for each other a few years ago. I will tell you about the stone another time. It is often a challenge to keep my relationship with God fresh. Over many years you can get into habits that carry you along and you forget what the whole thing is about and why you had such a fire in you at the first. The whole communion thing was like that for me for a while. Just going through the same motions and looking around at what people are doing. Forgetting what it is all about. But for me, Jesus said to do this for a reason and the point is so I will remember what it cost him for me to be right with God. It is free but not cheap. So forgetting to remember is beyond pointless. The price Jesus paid for me was above my ability to pay. I have a whole swirl of thoughts and emotions at this point. I remember my friend Bill introducing me once and saying “This man would kill for me.” In what were more God given words than my own cleverness I quickly responded, “No Bill, I would die for you!” There is a difference. I know both things cost dearly in the end, but they are very different. I think of people who have died for others in some radical, selfless way, like falling on a hand grenade to save their brother soldiers. I think of the World War I soldier who rushed out into a hail of bullets to retrieve his wounded friend only to be fatally injured himself. But not before he brought his fallen comrade back to the trench, dead. His sergeant said, “That was a waste” to the brave soldier who, with his last breath said, “Oh no, it wasn’t. He was alive when I got there, and he said to me, “I knew you would come for me, John”. Most of all, I think of what put Christ there on the cross. I have another friend who is not afraid to tell you what he likes and does not like. He told me once that he hated Jews because they had killed Christ. I had heard of this kind of thinking before but more from history rather than people who really believe this with all their heart and hold onto this hatred now. I was able to tell him, “No! If you need to hate someone for that, hate me. It was me who put him there. It was my sin that did that. I am the one who, by my choices, is responsible for that.” And that is truth. Christ chose that course because his father wanted it. It was the only way we would be able to have the kind of relationship with God that we were created for. I am not one to sit back and watch life. I am very interactive with nature and in whatever I do. So I have this little routine I go through when I take communion. I drink the wine and then, since there is always a last drop or two, I pour it into the palm of my hand and then rub it around to remember that it was me who put him there on the cross, I have his blood on my hands and it was me he had to die for. It is virtually impossible to think of this without grieving at the cost of my choices and I am always emotional at the thought that he loved me enough to buy me back at such a price. How do you keep the relationship from becoming religion. I was flying along with a friend, Alex, in the right seat of the plane today and he turned to me and said, “It makes you feel very small to be up here in the air.” I agreed with him that it changes your perspective. Then speaking of perspective, I mentioned how with the Hubble telescope, they now estimate conservatively that there are over 350,000,000,000 galaxies out there that generations of people didn’t even know existed. That makes me feel small! And when you consider that the nearest one, Andromeda, is over 2.5 million light-years away, (that is traveling for 2.5 million years at 186,000 miles per second), if you are not feeling pretty insignificant in the scheme of things maybe you just can’t comprehend this reality! 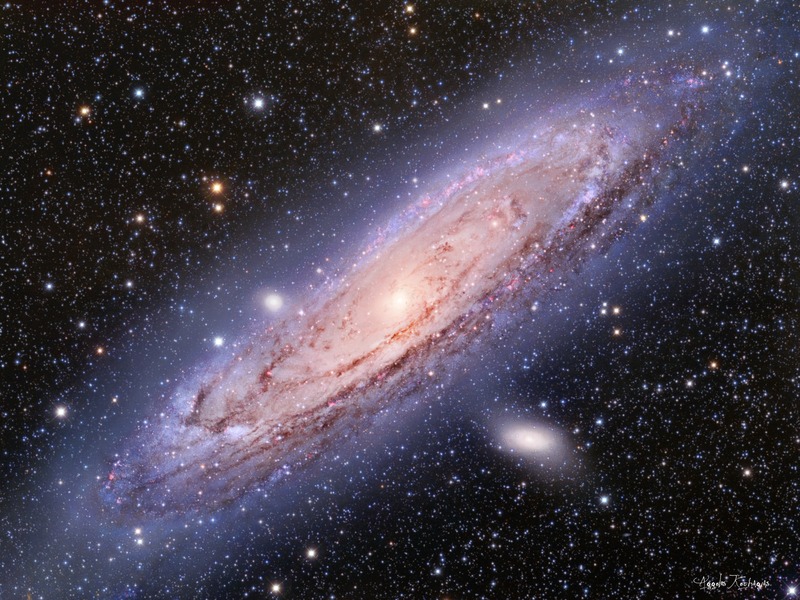 Oh, and Andromeda has one trillion stars, give or take a few I imagine. Why would God do that? Make all this stuff on such a grand scale that mankind is still only in the process of discovering. I have to think that God is way greater than I have ever imagined. I am in awe of him. Maybe that is it; he likes to wow us. Sitting around a fire at night under the stars can really get you thinking. And last time I wrote something here I was wondering if God talks to us? Cher says maybe I have “selective deafness”. Maybe I can’t hear the whisper for the roar! What do you think? What amazes you about our surrounding, big or small? I have not written anything here for a while and I really need so time around a campfire to talk with friends. We were sitting on the front porch reading a book and discussing deep things the other night and it came up whether God actually talks to us any more. I have been struggling lately to hear God talking to me. He has been so clear voiced in the past as to leave me beyond doubt that we can communicate as clearly as Cher and I can, and I love it when it is like that. But it is not always that way. I long for that clarity again and wonder why it varies through life. I hope sometimes that my ears to hear spiritual vibrations are not going bad like my ears to hear sound waves have. Too many airplane engines and guns I guess. I hope age does not dull your senses spiritually like it does your physical senses. I never want to be one of those guys who has given up and is sitting on the back row of life, too tired and disconnected to really be in the thick of things. I guess the nice thing to remember is that just because I do not have clear vision does not mean that it is nonexistent. Just because I am not hearing the symphony does not make the sound of the music not there. I like thinking of Beethoven writing symphonies that he never heard because he was totally deaf, and yet we still enjoy their sounds today because he knew where to put little notes on a piece of paper so well and in just the right order from years of experience. I will just have to remember that I am not without a history with God. This is not the first time things have been “quiet” between God and me and I am confident that we will talk again. In the mean time, I think I will talk to him more. Any of you have a surefire way to get back to where you belong, where everything isn’t so quiet between you and God? Tell me what you think. I am tired of the quiet. There are some comments below. I would love to hear yours. One of the things that is not my favorite about my job is the lack of time to do some of the things I like most. A pilot’s job is a hurry-up kind of job. It exists because “time is money” and we are supposed to “hurry-up and wait” for the people we fly so that their time is not wasted. This is Africa and it is not all that way here, but we start our days early and there is so much work that we could stay busy every minute until dark and not take time for things that are really important. Like family and friends or time with God. That is so important because everything else emanates from there. When asked to give of yourself in what seems like very large quantities on a daily basis, there comes a point at which you have nothing left to give. Then you start resenting what is asked of you and quite literally start to waste away in your mind and soul. Bitter not better. Something I’ve noticed over years of working in deprived and demanding places where there will never be enough of you to go around is that I do my best work from an overflow of what God is doing in me, not from anything that I manufacture out of myself. Like a cup for water, I am only useful as long as there is something besides me, inside of me. As soon as I am empty my purpose in being here no longer exists. And you would think that knowing this very important bit of information, I would take the time to use it! But the “tyranny of the urgent” does so easily take the place of the important. What to do? Making time is the answer. Time with God and time with your loved ones. I am no disciplined, focused efficiency expert when it comes to my time . Distractions too easily take me off the course. Cher, my lovely wife, will sometimes say to me, “I need time with you.” I say something man-like such as, “OK, what do you want to do?” She says, “I don’t want to do anything. I just want to be with you.” Now I am a very “thick” guy, but I think what she means is; I want TIME. Without an agenda, I want time to pass while we are together. Things will happen, we will communicate, we will enjoy each other and time will pass and things will be better after that. Is that what you mean my dear? Time passing while we are together. I like that emphasis. It is how you really get to know someone. No cheap shortcuts. It is what I like about sitting around a campfire. Let’s talk some more about this. You have any stories on the subject? One of the best things about being in the African bush is sitting around a campfire at night. In those hours just after dark when you are with your friends after some hard work, a sundowner in your hand, the smell of mopane wood smoke, staring into the hypnotic firelight, being amazed together by the sky above that is just busting with stars, talking over the events of the day as the fire turns to red and orange embers; it is a hard thing to beat. It seems to be just the right environment to let time run away with itself and to think deeply and talk freely about things that really matter. Walls come down. The problems of the your world are solved and if you are not careful, the young bucks around the fire might hear some amazingly useful thought ricochet by, a forever lesson that will stick with them all their life. I remember that happening to me. It is also a bit like a time travel machine staring into the coals. One can be transported back in time to other fires, other conversations. On the escarpment overlooking the Gokwe valley with the lights of a hundred fires down below dotting the ground making it look as if the earth and sky blend into one. The fireplace at the cabin on the beach with the waves crashing and cold rain pelting down outside, but we are warm around the fire. Then you might shoot over to Mana Pools, with the silhouette of the mountains behind and the Zambezi River rolling by in the foreground, hippos joining in the laughter of the last story told. It is magical. I have on occasion, had those same kinds of feelings and conversations not involving a campfire where something in the air allows men to open up and say the things that they don’t even know they really think until the words come falling out of their mouth. I have often felt that in the old used car lot office of Mainstream Motors, where Dave Woolsey has about 6 chairs set up around his campfire-like desk and a constant stream of men come and go and stories are told that have something in them that are worth taking away with you. Wisdom flows so easily that the need for a psychiatrist and the exchange of money is made completely redundant. Old retired mill workers and important university presidents and janitors and pastors of churches and fishermen and, well, bush pilots from Africa, all swap stories and somehow come out the other side a better husband or father or employee or boss or just a better man for being there. My friend, Mike McGregor, carries his campfire along with him wherever he goes. Men seem to know this is a man that can be trusted with their deepest thoughts and some unknown treasure awaits those who will take a step out over the cliff and say what they are really thinking. And somehow he makes it all seem the easiest thing. As if you have always longed to tell the truth that is in you. This is what I would like this page to be. Letting my mind run free to think out loud. Setting an environment for others to go deeper in their thoughts than they usually would. To become a better man. Let’s see how that works. Tell me what you are thinking that has taken you to another level of understanding your life. What is God teaching you? Thank you so mutch for your blog, it’s so cool to be a part of your stories. so glad that you are my friend. I also think of Naaman, he needed healing and God told him to go to the Jordan and dip 7 times, It says in II Kings 5-7 that Naaman was ticked, he wanted healing NOW, but God used the 7 dips (or waiting ) to adjust the state of his heart or to refine it. So sometimes I think that in his silence he is watching to see if we will use the wait to refine our hearts to Him and his purposes. I, like you, love those times of clear definite times of hearing the Lord, but I think he lets us struggle along to strengthen our hearts, to refine our hearts and to use the ingredient of the quietness to produce miracles in our lives. I think the most important thing is to keep showing up everyday listening and waiting, because those who wait upon the Lord shall renew their strength. Hi Jon, Shannon and I send you and Cher our love from Alaska. Thanks for your honest words about wondering if the Lord still speaks. Yesterday I read a precious verse – “But whoever loves God is known by God.” 1 Corinthians 8:3. It’s so amazing to think that He knows us so well, and He knows you are listening. He will speak and you will hear because He’s your loving Father and Father’s don’t hide from their children. Hey Sonja and Shannon, So great to hear from you! What are you doing in Alaska? That is a far cry from the Zambezi River and a bit colder as well. I know God speaks. He has before so clearly that I am hungry for that close thing we had that is so exciting. Conversations. Not just me talking. Please let us know all your news. We miss you guys too much. You have our email right. Send us some pix! I have been enjoying basics lately. I find that I try to look at God’s word and then pick out key points and simplify them into something understandable for my kids. The current one I am working on having them remember is summed up in these two questions and their answers. I love the balance in these two things. Christians are affected by their relationship with God and they are changed and they do, as a result, obey God’s commands. Is that an every time thing without any room for failure? No, or John wouldn’t need to say, “But if we do sin we have an advocate. . .” in 1 John 2: 1. We aren’t perfect but we are being made perfect and it is a sure thing. Hebrews 10:14. But I know that I am prone to look for my own value in God’s eyes in my works. So I am very grateful to know that my salvation is not brought about by anything I do. I love that Paul goes to special lengths to point out that even the faith in God is not of ourselves so that non of us can show off or brag about it. Or in my case worry about. I really hope I can get this concept seared into my kids’ brains. I want them to examine their lives for the fruit of a real and close relationship with God and take note and do something about it when they don’t see that fruit present. On the other hand I never ever want them to be concerned that they aren’t loved by God. I want them to be certain they are totally in with him because of what he has done, that it has nothing to do with them and they can never change that any more then they could stop me loving them by disobeying me. Anyway this is the truth I have been thinking about and enjoying its complexities and simplicities lately. I thought you might enjoy it. It is great to have you share here as we like to do when we are together. I like your plan for simplifying for your kids. It is probably way more important for us adults to simplify than we know. Basic distilled truth that you can hang onto no matter what is going on around you is so important. I especially like your ending statement that being a Christian is because of what HE has done. In the same way that your kids could never get you to stop loving them by the way they act or what they do, so God will never stop loving them. I was a bit worried where you were going when you said, “How do you know you are a Christian? I know I am a Christian IF I obey God’s commands.” Because frankly, when I am doubting being a Christian the most, I am not what you would call obeying the most. I think you can distill even further. IF we could obey God’s commands then the Jews were doing fine and there was no need for a Messiah to come. But God knew that we could not obey. Does that make us not Christians? Of course not. If I want something to hang onto to know I am a child of God I always go to places like John 3:16 or Romans 5: 6-8. “You see, at just the right time, when we were still powerless, Christ died for the ungodly. Very rarely will anyone die for a righteous man, though for a good man someone might possibly dare to die. But God demonstrates his own love for us in this: While we were still sinners, Christ died for us.” That gives me confidence! I look at the whole ‘obeying’ thing like a marriage relationship. It can be the most wonderful thing or it can be terrible. You can still be married and yet missing all the joys of it! Walking in step with each other, pulling together, or wanting your own way and pulling in different directions. I am continually depending on the amazing grace of God. Knowing that it is always there, separate from me and my actions. Funnily enough, it is that amazing grace extended to me, when I deserve it the least, that motivates me to “obey his commands.” Then the good stuff is more like the fruit that you were talking about which grows out of me more than good things I might stick onto myself, a sort of bling, if you get my meaning. When I am focused on his grace I do things because I think about them in the same way Jesus thinks about them. And that happens when I am with Christ a lot. I love the rest of that passage in 1 John 2:5 that says, “This is how we know we are in him: Whoever claims to live in him must walk as Jesus did.” You know my goal of being like Christ. It is virtually an unobtainable goal, and yet, we should always be striving for it. But I do it best when I am in him. Walking where he is walking. Stepping in his footsteps. I like to have my thinking challenged. Reading your response I wonder if my questions and their answers are clear enough to be helpful and not harmful. I hope that I have talked this whole topic over enough with my kids that they actually understand the truth I am trying to make them remember with these questions. I want them to know that God loves them and that it isn’t about behavior it is about relationship. We can look at it like a marriage relationship or a parent child relationship and probably many other ways. The point is that God’s love is not a response to our behavior. The love is due to who he is in relationship to us. I also want them to know that a relationship with God changes us. We do actually take on his personality a bit and start to think like him and behave in the way he behaves. It is just a part of being near him and spending time with him and even wanting to please him. But we can totally ignore what pleases God and what benefits the relationship. So it is important to actually look at our behavior. Our behavior is an indicator of the health of the relationship. However, it is not going to remove the relationship. So how do you think I could say that in a clearer way and yet stay concise? I really like how you are stating you position now. I find that it is so easy when talking of how one acts, (“Our behavior is an indicator of the health of our relationship”), for others define in their mind what it is God is going to be happy with and whether we have a healthy relationship. While there are good indicators that grow from a healthy relationship such as the fruit of the Spirit in our life… love, joy peace, patience, kindness, etc. it is not our place to judge and somehow we always pick crazy things like the length of our hair or skirts or whether we drink or smoke or like tattoos or ear rings as indicators. As you say, God’s love is not a response to our behavior. God does not love us for who we will be someday. He is happy with us now. I think of your kids, who it is not my responsibility to raise, as it is yours. I love them totally. I can see their faults but it has no bearing at all on my love for them. That is complete and I could not love them more if they were perfect in every way. I have heard it said, “God is as happy with the green apple in the spring as he is with the ripe apple in the fall.” There is a process that we go through in our relationships that is all good even though not all right. In fact, you may well lose some things by winning others. I sometime think I would trade some of my hard won knowledge with it’s seriousness for more of the emotion that came with that time of first love. Maybe what I am trying to say is that there is a priority in life experience. Where you might want your kids to know all that is important, you start with the foundation and build. It always amazed me when I was building houses how long it took to get the foundation in the ground so we could start with the main body of the house which went up rather quickly in comparison. Then finish work and trim seemed to slow everything down again. If they can nail down the first thing they will be streaks ahead of the pack. If they understand the cross. Christ takes my sins and I get His righteousness. If they really understand that, you can relax into the rest.